Everyone loves a barbie in the sun, and your local patch of green might seem like the best place to head to - but not every park in London permits them. Here is a list of the parks where you can barbecue, sizzle and smoke to your heart’s content. Nestled in the heart of Islington, Highbury Fields is prized by residents. There’s a bandstand, a café, a whole leisure centre, tennis courts… we could go on. But most importantly, you can barbecue there! There’s also a great kids’ play area with lots of fun to be had, so this is a good one if you’re bringing the family along. Unfortunately for South Londoners there aren’t many parks south of the river that allow barbecuing, but Burgess Park in Southwark isn’t one to be sniffed at. One of London’s biggest parks, there’s plenty of green plus a lovely lake to look down on while you cook. A BMX track also opened in the park a few years ago in 2013 where you can burn off the burgers. London Fields has designated barbecue areas, clearly marked out by signs, so you can grab a spot to get your grill on or avoid big clouds of smoke if it’s more of a cold picnic kind of day. The park is located right next to Broadway Market, so you can grab yourself some lovely artisanal sossies or burgers beforehand. Or why not pop down to the lido (it’s heated!) to work up your appetite first? Nope, you’re not allowed to barbecue on the heath, unfortunately – gotta protect all that lovely grass. But if you find yourself hanging out Hampstead way on a sunny day and get the hankering for a burnt sausage or three, Waterlow Park is just around the corner, and it’s licensed to grill - all 26 acres of it, in fact. Take a creepy walk through Highgate Cemetery once you’re nice and full. 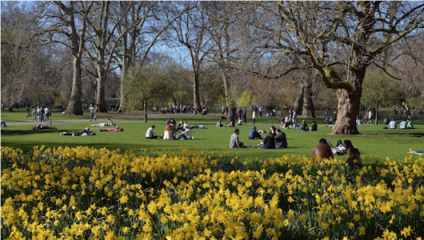 Set right in the heart of the capital, Lincoln’s Inn Fields is the largest public square in London, a little oasis of peace in Holborn. What’s more, it’s technically in the borough of Camden, meaning barbecues are allowed here, so set up and get cooking. Why not finish off your day with a trip to Sir John Soane’s Museum, located on the square, which you can explore with all its fascinating collections of sculpture, antiquities and more, exactly as it was left 180 years ago at his death.